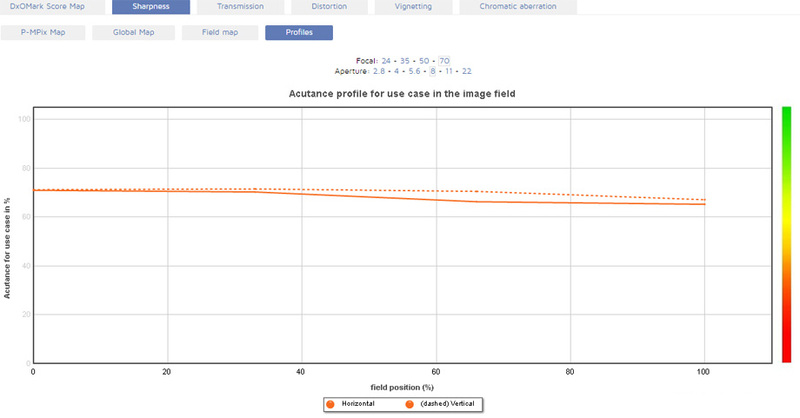 Sony’s insight into sensor technology is said to have heavily influenced the optical design, with an emphasis on resolution and manufacturing precision, particularly during preparation and positioning of lens elements. In terms of optical construction, the 24-70mm F2.8 uses 18 elements in 13 groups, complete with a mix of aspherical, Super ED, and ED glass types, and Nano AR coating. The lens features what’s called a Direct Drive SSM (supersonic wave motor) for fast and near-silent AF operation. Minimum focus is 14.96” (0.38m), with a maximum magnification of 0.24x. Externally, the lens has a focus hold button, but like most other FE series models, it lacks distance markings and an aperture collar. Despite being intended for mirrorless camera bodies, the lens remains large, with a 82mm accessory thread, and measures 3.45 x 5.35” (87.6 x 136mm). It is also relatively heavy and weighs in at a substantial 1.95 lb (886g). 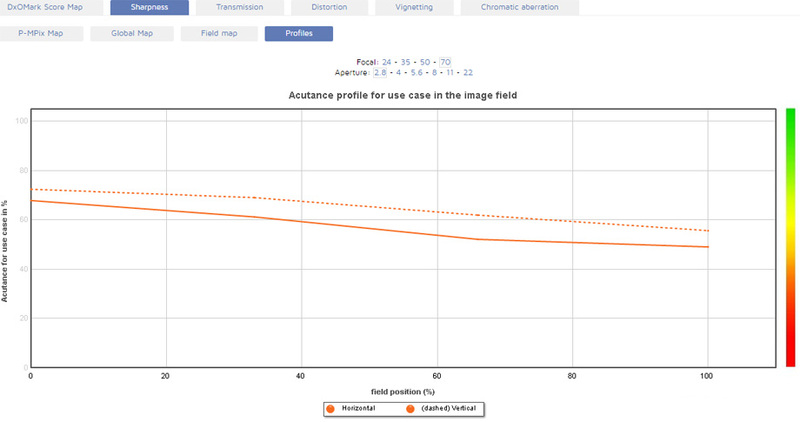 We’ve analyzed the lens using the full-frame 36-Mpix Sony A7R and are delighted to share the results. Tested on the older full-frame 36-Mpix Sony A7R (an A7R II body was not available at the time of testing), the new lens achieved an excellent result overall. At and close to the initial aperture, sharpness levels are very good centrally between 24 and 50mm. However, as with many zooms, performance at the longer end isn’t quite as impressive. This lens has some astigmatism throughout the zoom range, and it’s quite noticeable at 70mm wide-open. Fortunately, on stopping down, the sharpness improves significantly, particularly in the outer field, though the astigmatic nature of the lens isn’t entirely eliminated. Distortion is also higher than we would expect at this level. While it is average at 24mm, that’s not the case at the longer end, where pincushion distortion is relatively high, particularly at around 50mm. Nevertheless, the metric scores also highlight some of the Sony’s strengths. Complex zooms like this rarely have good transmission, though to be fair, that has changed lately. The Sony’s T2.8 maximum aperture is excellent and more so when you realize that it doesn’t vary throughout the range, which will no doubt be of interest to serious videographers. Also impressive is the generally low vignetting, especially at 70mm. Most impressive of all, however, is the very low lateral chromatic aberration. 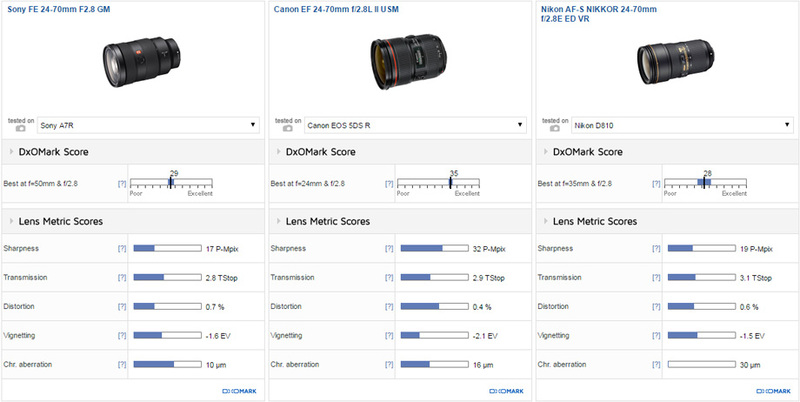 In this comparison we’ve tested the Sony against the equivalent Canon and Nikon rival models. We’ve chosen the higher resolution 50-Mpix Canon EOS 5DS R to highlight the potential of the Canon combination, but even when tested on the lower 22-Mpix resolution Canon EOS 5D Mark III, the EF 24-70mm F2.8L II still achieves peak sharpness levels similar to the Sony. Still, it will be interesting to see just how the lens performs with the newer sensor in the A7R II. In the meantime, the astigmatism present certainly appears at odds with the maker’s claims, but it’s not the only lens to exhibit higher-than-expected levels: the Nikkor has its fair share. On the plus side, it can contribute to some attractive renderings, but that’s always subjective. By contrast, the Canon has extremely low levels of astigmatism and offers consistent sharpness across the frame. The Canon also has lower levels of distortion at every focal length. Only the Nikon has higher levels of barrel distortion at 24mm. Nevertheless, the Sony can’t be beaten on transmission and vignetting is well-controlled in this group. The Sony has the lowest of the three at 70mm. 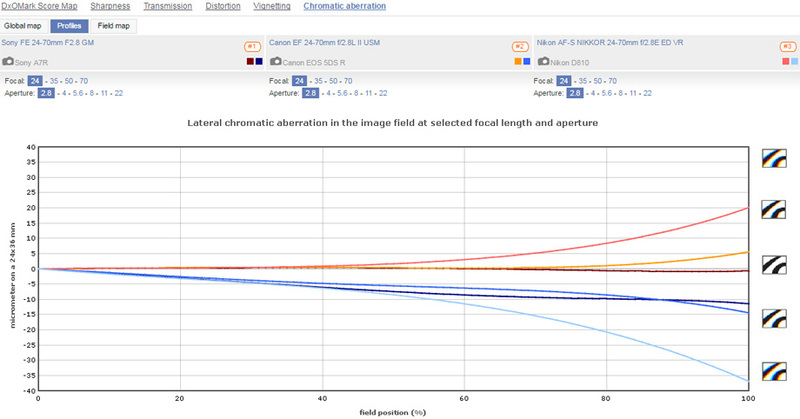 It also has extremely low lateral chromatic aberration for this type of lens. Even at 24mm, where these lenses tend to show the most LCA, the Sony is very well-corrected across the frame to the extreme corners. That level of correction is rarely seen on zoom lenses and goes to show that Sony has done a lot to minimize the effects at the source, rather than rely on software that isn’t always compatible with earlier camera models or that vary in effectiveness among them. 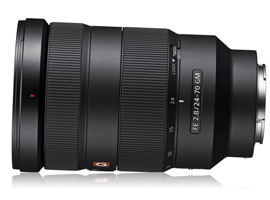 Given the emphasis on the high-grade components and construction to match the maker’s high-resolution sensors, we had high hopes for the Sony FE 24-70mm F2.8 GM, and we weren’t disappointed. It is the best-performing zoom in the maker’s range and can easily hold its own against the new AF-S Nikkor 24-70mm F2.8E ED VR. However, for edge-to-edge to sharpness, the Sony isn’t quite in the same league as the Canon EF 24-70mm F2.8L USM II, but we still have to add the Sony A7RII to propose a fair comparison with the 50 Mpix Canon EOS 5DSR. Nevertheless, the Sony does have certain strengths — better transmission and lower lateral chromatic aberration than many high-grade primes — and while certainly pricey, it’s still a competitive and tempting addition to the range.